I’m not much for kitchen gadgets. Please, I don’t need a quesadilla maker, or a frozen pop maker or any other ‘-maker.’ I like simple tools that function well. Like the swirl mixer. My grandmother and mother both have an old aluminum swirl mixer in their kitchens, and use them often. I have a plastic one, which doesn’t seal thoroughly and is therefore not of much use. What’s a swirl mixer? It’s a handy lidded cup with graduated measurements that’s perfect for blending ingredients. The Mirro company made the aluminum swirl mixer years ago. It’s no longer available, except for on eBay, where I scored the one below. 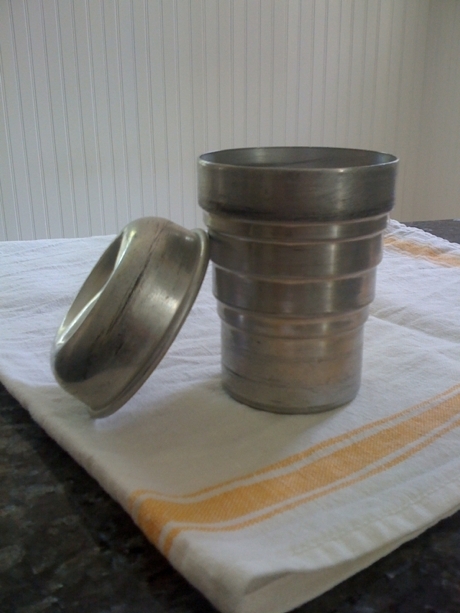 Grandma uses hers to mix flour and water as a thickener for sauces or gravies. I use mine to make super easy homemade salad dressing. It’s also handy for making a quick batch of homemade butter. You could also use it to shake up a small quantity of whipped cream. Or single-serve cocktails. What kitchen tools do you find essential? What tools in your grandmother’s kitchen are also in yours? (I would include an old Mirro cookie press, Ball canning jars and a pastry cutter on my list.) Share your gadget stories below! Sticky Toffee Pudding /Old Or New? /There is a God. They use high fructose corn syrup in a higher concentration than their bottled syrup-its what keeps everyone coming back for more. Corn syrup is nasty stuff-tasty yes, but very unhealthy. HFCS is what makes MOST commercial foods taste good. If you make it yourself, you will get used to the less sweet taste and mouthfeel of the coffee. The big businesses do not want you to be able to duplicate recipes at home-otherwise, no one would be buying in the stores. They sell you the stuff knowing that it won’t taste the same. My niece used to work at Starbucks and even she cannot duplicate it at home-its the extra flavoring in the syrups they have in the stores.